Using a concealer is a very essential step in applying makeup. However, it is the one thing that most people skip. They just apply foundation and some powder and they are all set. Now, if just foundation and powder can make you look this beautiful, imagine what adding concealer to this routine can do? If you are like this, today I’m going to give you reasons why you need to use concealer too. Do you know someone with a lot of acne scars but anytime they apply makeup, their face look as if they’ve never had acne? But you do your makeup and you can’t get that look? Well today, I’m here to tell you their secret. Their secret is the concealer. 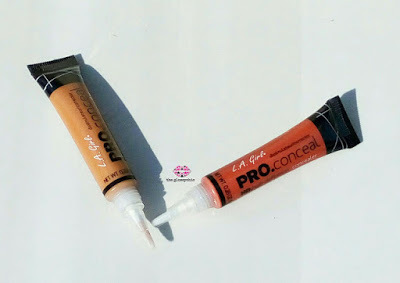 Just as the name implies, the concealer is used to conceal dark areas, spots and blemishes. So if you have some blemishes on your face, all you have to do is to apply a little bit of concealer on the problem areas after the foundation and your face will look spotless. If you are like me and you have these dark circles around your eyes, the concealer can be used to conceal these dark circles and brighten your eyes. Giving you that youthful glow. Applying eyeshadow directly on the eyes doesn’t really bring out the colour of the eyeshadow and the eyeshadow does not even last long. If you want to achieve a more beautiful eyeshadow look that lasts long, apply some concealer as your eyeshadow base and set it with some loose powder. It makes your eyeshadow easy to blend, brings out the colour and lasts long too. Did you draw on your eyebrow wrong? Did you line your lips wrong? Or is there some lipstick outside your lip line? Don’t worry. Just use some concealer to clean up the problem areas with a brush. Before applying your lipstick, apply a thin layer of concealer on your lips. This will bring out the colour of the lipstick and make your lipstick last longer. A concealer that is two shades darker than your skin tone can be used to contour the face and a concealer that is two shades lighter than your skin tone can also be used as a highlighter. These are all reasons why you need to start using concealer. If you use concealer for anything else, please let me know in the comment section. Laziness makes me skip it sometimes. Thanks for these wonderful tips, Wendee. Yes!! i so agree with all of these points!! Love my concealer! I cannot imagine my life without a good concealer. Maybelline, Tarte and LA Girl have some of my my faves. Concealers sure are a great add on to any makeup look simply for the reasons you’ve stated! I’m one guilty girl of foundation(bb cream)+powder, haha. Fear not, I’m looking forward to buying a concealer because I want to try the concealer+powder make up. I’m not an expert in make up so I try to keep it minimal and natural as possible. I always use concealer for under the eyes. It helps a lot! Such a nice read you have here dear. I love concealer, they make contouring really easy. And yes, they give lipsticks more pop of color too. I don’t use concealer, but after reading this, I might get into it. Thanks for sharing Wendee. Hope the family are doing well. Have a blessed week ahead. Concealers are an absolute must-have when it comes to makeup products. Thank you for this informative post! I am a huge fan of concealers!! It’s perfect to hide imperfections and on days when I don’t feel like wearing foundation, it does the trick while leaving my skin looking super natural! Such an informative post! I never use concealer but now I think I need to start. Thanks for sharing. I agree with all of the reasons you’ve shared here, it’s a product that I nearly always apply, especially as a new mom, haha! Those brightening benefits have helped so much. Thanks for sharing, girlie, and I hope you have a great week ahead!